Are you ready to bring a new cat into your heart and home? Welcoming a cat requires some simple preparation. 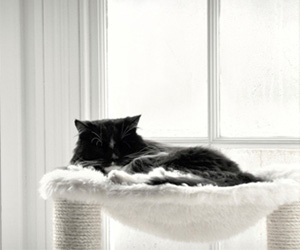 Here are my tips for creating a cat-safe, cat-friendly home for your feline. While it is important to cat-proof your home before your new feline arrives, keep in mind that she will still require supervision. But, you can minimize the risk of a catastrophe by taking a few simple precautions. Be vigilant about picking up items with which your cat may play or put in her mouth, such as rubber bands, string and children’s toys. Secure blind cords and remove all plants. Cover electrical cords to prevent chewing and, if possible, unplug them when not in use. Lock away potentially dangerous substances and items, including medications, cleaning products, food and small household items. Protect your cat from escaping through doors and windows. A locked screen door or temporary baby gate can deter some cats who are particularly keen on bolting out an open door, but be aware that cats have been known to climb baby gates. Windows should have securely attached screens — felines can easily misjudge or get distracted and fall from an open space, like a window sill. And small kittens may be at risk for jumping up on the edge of the toilet and falling in, so be sure to close the lid! Cats like to climb and jump, particularly onto high spaces. If you have breakable or potentially harmful objects located in places where your cat is likely to climb, consider relocating them to a protected and enclosed space away from your cat. A microchip and ID tag are essential for all cats, even those that live entirely indoors. In addition, you may want to consider a GPS collar as a way to track your feline if she should ever escape and become lost. Your cat has a few basic needs: eating, drinking, sleeping and eliminating. Before she comes home, make sure you have provided for all of these — as well as offering her a few things to improve the quality of her (and your) life. Food and water bowls: If you have more than one cat create multiple feeding and watering stations to decrease stress from competition. Using food puzzles for treats engages your cat, both mentally and physically, while hiding portions of each cat’s meal in high spaces encourages hunting behavior. Litterbox: You will need at least two litterboxes, as well as an additional box for every additional cat, with each box located in a different place in your home. Keep in mind, though, that the specific number of litterboxes can be adjusted depending upon the cats in the home. If you live in a multistory home, for example, you may opt to have one litterbox per floor. Most cats like fine-grained, clumping litter with advanced odor control. Place litter in a large, uncovered box that’s cleaned at least once daily. Resting areas: Providing various places for your cat to rest can help keep her out of spaces that are off-limits — the kitchen counters, for example, or bookshelves. Make these designated resting areas as inviting as possible, and reward your cat with attention and treats for choosing the desired area. If your cat likes to hide, consider covered beds placed in spaces where she’s likely to feel protected, such as up high or behind a large object. Climbing spaces: Vertical spaces, such as cat trees, cat condos or cat shelving, can help create more square footage for your cat without taking up too much floor space. In addition, vertical surface areas can provide your cat with potential escape routes or getaway spaces from children or other pets. Scratching posts: To help prevent scratching on inappropriate surfaces, like your couch, give your cat multiple acceptable areas to scratch. Provide at least one post that’s sturdy, high and vertical to allow your cat to stretch out completely. Use coaxers around the scratching area, such as catnip, or draw her to the scratching post with toys and treats. As your new cat settles in, there are a few final things to consider. Crate: Your cat needs a portable kennel for any travel, including veterinary visits. Opt for one with a removable top and at least two exits. Train your feline to enjoy her crate space. Toys: Playtime helps your cat release energy and bond with you and your other cats. Offer your cat both toys with which she can play on her own (including motorized versions) and interactive toys, like the feather and wand type, that she can enjoy with you. Personal space: Your cat needs an area where she can hang out safely when you’re not around to supervise her. This space should include all of your cat’s essentials, including food, water and a litterbox, and should be free from any hidden hazards, like small items on the floor or exposed cords. Safe outdoor access: I’m in favor of allowing cats to experience the outdoors, but only in a protected space, such as an enclosed patio, cat enclosure, cat-safe fence or on a kitty harness and leash. Or, you can bring the outdoors inside for your cat by creating an indoor garden of cat-safe grasses and plants on which your feline is allowed to chew.